McGuire Memorial’s main campus, located in the Western Pennsylvania town of New Brighton, PA, has, since its founding in 1963, served those who are physically and developmentally challenged, including those with profound multiple, complex disabilities. 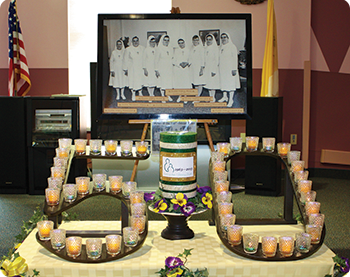 McGuire Memorial, a co-sponsored ministry of the Felician Sisters of North America and the Diocese of Pittsburgh, is a not-for-profit, non-denominational facility open to people of all faiths and backgrounds. McGuire has always operated under the guiding principle that every person, as a unique gift of God, is created for a sacred purpose and is able to attain a fullness of life. As a direct result of that core value, every individual served at McGuire Memorial is loved, supported, and encouraged to reach their fullest potential. McGuire first became known for its Intermediate Care Facility for Individuals with Intellectual Disabilities (ICF/ID), a unique program for the care of those with profound multiple, complex disabilities—a program that is still regarded as legendary in its care and commitment to those it serves. Today the ICF/ID is home to individuals with intellectual disabilities ranging in age from pre-school children to adults—individuals who are severely and profoundly disabled. Over the years, McGuire Memorial’s driving mission—to continually help its residents reach their fullest potential by helping them embrace new challenges, new skills, and new experiences—fueled McGuire’s physical expansion that began in1994. Under the direction of McGuire Memorial’s president and CEO Sister Thaddeus Markelewicz, a multi-year development plan forged the creation of the Program Center with its floor-to-ceiling windows, 12 classrooms, activity rooms, a dining/multi-purpose room, swimming pool, and chapel. Construction of McGuire’s greenhouse on the main campus soon followed, allowing those who have lived their entire lives in a relatively sterile environment to know what it feels like to dig in the dirt, plant flowers, and watch something of their own grow. With the addition of the greenhouse, individuals at McGuire now would have a chance to take care of something of their own, having been taken care of all their lives. While comprehensive services to McGuire’s residents had been strengthened over the years, McGuire Memorial continued to see a tremendous need for its services within the larger community. Families throughout the community were in need of additional services, treatment, and instruction. Hence, in 1997 McGuire’s outreach ministry began, developing a School licensed by the Pennsylvania Department of Education, a Community Home Program, and Adult Training Programs. The School at McGuire Memorial, a private school licensed by the Pennsylvania Department of Education, now reaches a broader range of children as it reaches out to surrounding school districts, offering comprehensive academic programs based on the specific individual needs of each student. Children who have mild to severe intellectual disabilities; autism, physical and developmental disabilities; and those who are medically fragile with complex, multiple disabilities, attend class along with McGuire’s residential students. Students come to McGuire whose educational opportunities would otherwise be limited due to severe medical needs, behavioral needs, physical or cognitive challenges, or challenges presented by a specific disability such as autism. A pre-school program was recently added to The School at McGuire Memorial, serving children ages 3 to 5. The Transition Program for Students with Autism is also a new component to The School at McGuire Memorial, providing services specifically for students with autism ages 18 to 21. Another key area of McGuire’s outreach efforts has been in the creation and expansion of a range of adult training facilities, offering programs designed for adults with various disability levels. One such facility, the Saint Joseph the Worker Employment Option Center, is a day program providing vocational training and school-to-work transition programs for adults with mild to moderate disabilities. It encourages the development of self-determination, self-advocacy, and the ability to make choices. McGuire Memorial has achieved much in its relatively short history. Yet there is still so much yet to be done, for the need is great.